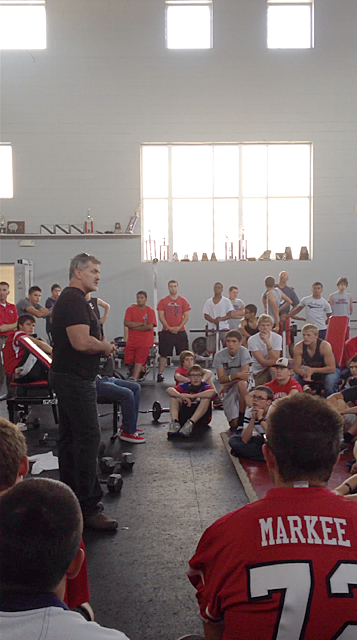 This past September a friend asked if I would speak to the Aubrey High School football team on the afternoon of their Homecoming game later that week. 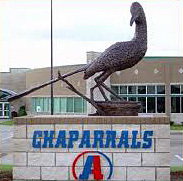 Despite having no prior contact with the school or team located well north of Dallas’ suburbs, I said ‘sure.’ The request had come totally out of the blue, but I had been praying for opportunities to speak again after years of dormancy, so I figured it could be a blessing. Then I began researching their season and discovered they were 0-3, with defeats getting worse each week. I learned they were plagued with injuries to key players, had a suspended star player and a young, inexperienced coach replacing the All-time winningest coach in Texas high school history, who apparently knew just when to hang ‘em up. Oh, and they were facing 3-0 power-house and arch-rival Pilot Point, a team they had beaten just once in 39 years. My brain began to fog and my eyes became glazed as I started hyperventilating – and thinking of reasons to back out! I groped and grabbed desperately for motivational ploys possibly stored in my memory banks, when suddenly I was inspired by the image of journeyman boxer James ‘Buster’ Douglas. Douglas had fought the undefeated (36-0, 32 KO’s) Mike Tyson for the heavyweight championship of the world on Feb 11, 1990 in Tokyo Japan. My body tingled as I recalled the event and how all expectations were for ‘Iron Mike’ to destroy Douglas as he had most of his opponents including the last challenger he dispatched in just 93 seconds, something that infuriated pay-per-view patrons who felt short-changed by the quick knockout and caused many Vegas casinos to cancel odds and refuse any bets on the Tyson-Douglas bout. To make the odds even longer, Douglas was heavy-hearted with the loss of his mother just three weeks before the fight. In other words Buster Douglas didn’t stand a chance. 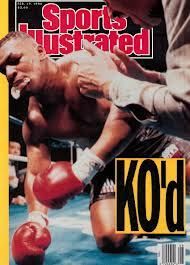 But Buster Douglas was a believer. He had a miracle mind-set that anything was possible. Maybe, just maybe he could shock the world. When I arrived at Aubrey High on Friday afternoon things didn’t look good. There was little indication of Homecoming spirit and more than enough late summer heat beating down to oppress any thoughts of halting a losing streak. Inside their field house the air was heavy with determination and resignation – the odd mixture that forms when youthful pride meets the ever hardening reality of injuries, bad breaks and thorough beatings. The gracious coaches and other adults I met were almost apologetic about their plight and my nearly impossible task of helping them. The weight of tragically low expectations threatened to extinguish any hope I had brought with me. After they gathered the kids I told them they didn’t need a motivational speaker or an inspirational message. No, they needed a miracle mind-set. I told them they needed to believe Jesus who said a mustard seed of faith could move a mountain and that anything was possible for those who believe…a fumble recovery, a deflected pass for an interception, a punt return for a touchdown…how little separated winning and losing, an 0-3 record from a 3-0 record, how much pressure a 3-0 team feels playing an 0-3 foe that refuses to lay down or quit…how they could make up their mind to ‘shock the world’ that very night. I asked the team to repeat those words out loud several times as I shared how Buster Douglas used his one and only advantage (superior reach) to jab his way through five rounds, gradually swelling Tyson’s eyes to mere slits and causing panic when Tyson’s corner men realized they’d forgotten their EndSwell tool for chilling swollen flesh between rounds (they had never needed it before! )… how Iron Mike became frenzied, fighting frantically for several rounds, finally dropping Douglas for an 8-count in the 8th round, then assaulting him in the 9th like a shark smelling blood in the water… the bully champion would finally have his way and dominate yet another weaker foe. But refusing to fold, Buster Douglas fought back and survived that round and then, counter-punching with a furious combination in the10th, he bludgeoned Iron Mike down to the canvas, where he dizzily crawled on hands and knees, wobbling and searching for the mouth piece knocked loose by Buster’s right hand blast to his temple…the count reached 8…9…10 and it was over! Photos of that moment stand among the most poignant ever taken. Yes, miracles can and do happen. 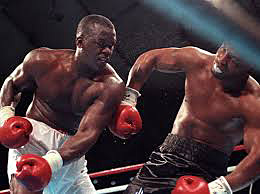 Buster Douglas had shocked the world. And so could this small-time, small-town 0-3 team in Texas. I shook hands with each player and coach, then drove home wondering if my words had hit their target or bounced off the walls of the expansive weight room where we had gathered. The most impressive things about the team had been the suspended quarterback who couldn’t play and the number of injured players I had met. I had serious doubts about their chances and despaired over the thought of these boys getting pummeled on their Homecoming night. I dreaded reading their game score online or in the next morning’s paper, as I couldn’t stay to watch the game and feared it could get ugly. So I prayed they would rise up with a fearless spirit and at least give it their best. As time passed into evening I questioned how cruel it might have been to raise the hopes, dreams or expectations of such hopeless people, a team that didn’t stand even a fighter’s chance to win. Was my love of public speaking, of exhorting, of flat-out preaching just a big ego-trip for me, and actually a disservice to my hearers? Was I simply doing more harm than good? Did this speaking opportunity confirm my calling to stir faith and set alight the fire in people’s hearts, or just make a hopeless situation more miserable for everyone? I hoped the former but feared the latter, as darkness filled the night sky and threatened to consume me. I didn’t know whether to laugh or cry. “Whoa! !” I yelled and kept repeating out loud as goose-bumps and awe swept through every cell of my being. What utter relief!! What fantastic joy!!! I was so happy for those kids and coaches, their families and friends – people I didn’t even know before my visit but supernaturally grew to love and care about. What a miraculous gift from God they had somehow received! Another text came later, describing how the team had passed through their tunnel on their way to the field, chanting something about shocking the world. Heavenly Father, thank you that nothing is too big, too small or too difficult for you. Thank you for being a rewarder of those who seek you by faith. Help us to live boldly by faith and share it with those around us. In Jesus’ name, Amen!